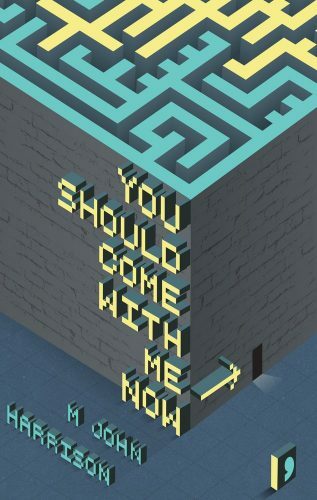 Longtime literary iconoclast M. John Harrison returns from the outer reaches of weird fiction with You Should Come With Me Now, his first short story collection in over a decade, and his first book since Empty Space in 2013. The trajectory and influence of Harrison’s career have never been straightforward or easy to paraphrase. He has, however, consistently written books, articles, blog posts, and story collections that challenge readers and defy the boundaries and conventions of genre. With You Should Come With Me Now, Harrison once again gifts readers a text that is as much a set of linguistic, philosophical, and psychological tools for interpreting themselves and the world as it is a story collection. This first story, then, introduces us to lists. You Should Come With Me Now is packed with them. Lists have long been a staple of Harrison’s fiction; here, they go beyond ornamenting a story and become a structural framework for several pieces. “Places You Didn't Think to Look for Yourself,” for instance, is in its entirety a list that follows the title: “In the light falling horizontally along grey lapboards … In the idea of coughing up your large organs … In Rotherham,” etc. (p. 79). Likewise, three pieces—“Imaginary Reviews,” “The Theory Cadre,” and “Babies From Sand”—are numbered collections of smaller chunks, almost all of which originated as blog posts arranged by a theme. Another challenging feature of Harrison’s writing is perspectives shifting. Sometimes this is enacted as a central, confrontational core of a story, as in the flash fiction “Rockets of the Western Suburbs.” A sketch of family life in Barnes is suddenly interrupted when, “[w]ithout warning … the camera cuts away from this: very fast, upwards, turning in a series of vertical 180 degree snap rolls” (p. 21). “The Crisis” shifts between a third-person account of Balker, a homeless man new to London, and a second-person perspective that implicates the reader in his death during a prolonged invasion by giant astral rhubarb stalks. Other stories see perspective shifts slipped in almost without notice—a kind of authorial sleight of hand—best exemplified in “Entertaining Angels Unawares,” when the narrator overtakes his boss Ed’s depiction of a recurring dream of murdering children, thereby claiming ownership of the dream and foreshadowing his desire to share it. The second story in the collection, on the other hand, is a traditional one, “In Autotelia,” beginning a saw-tooth motion between shorter, amorphous vignette pieces and longer, more narrative ones. The juxtaposition between story types is mirrored by Harrison’s tendency to continuously imbricate the mundane and the fantastic, and deploy images in which nature collides with the artificial or constructed environment: “In the harbour the tide is down, there’s dark algae on the surface of the mud. A swan sleeps amid the yellowing fibreglass litter between the moored boats. I look back at the hill and, parked round its base, all the wrecked cars” (p. 209). Add to this numerous references to real world brands, objects, and places cohabiting the stories alongside fictitious ones, and we find ourselves inside a blender of genre and storytelling modes that promise to congeal into a discernible substance, but linger at the edge of coherence. If anything coheres from the vertigo brought on by the lists, perspective shifts, and juxtapositions, it is that this suite of denials of the “common” or expected reading experience forms an invitation by Harrison to co-create the text. He has stated before, in a blog post that has since become infamous, that, “My feeling is that the reader performs most of the act of writing. A book spends a very short time being written into existence; it spends the rest of its life being read into existence.” Nearly every structural, narrative, conceptual, and linguistic decision on Harrison’s part, by virtue of challenging the reader, thereby invites them to make sense of those decisions, interpret the text, and so create their own version of it. This invitation isn’t always a challenge. There’s a lot of wry humor in the collection, like when the narrator of “Dog People” tells his girlfriend, Myra, a story about cats that sounds as if Neil Gaiman wrote a flash fiction, only for Myra to dismantle it with a six-word riposte. Or when aliens visiting a post-humanity Earth determine that jackdaws were our method of storing data. Much of the humor and lightheartedness of the collection resides in the shorter pieces derived from Harrison’s blog. It cannot be stressed enough how much this decision to source from his blog thereby influences the collection. Blogs document shifts in their authors’ concerns, intentions, and moods over time, in a way that does not often happen when there is a “vision” for a final product. The subsequent tonal variety throughout the collection serves as the literary equivalent of candid camera shots, and invites us into Harrison’s personality in a way that few other collections can rival. A key to finding leverage amidst the delirium of Harrison’s work is repetition. Not only is recycling his own material a prolific technique of Harrison’s—a process he calls “versioning,” which sees much use here—but the stories continually reference each other as the collection progresses. It is possible to combine these connections into startling insights. For instance, the act of excavation becomes a prominent theme in the text. A husband, Tim, spends the entirety of “Cicisbeo” “digging” a luminous tunnel out of his loft, and in doing so abandons his family. “Psychoarchaeology” documents an economic boom of exhuming “dead Royals”: ‘Now that science tells us they are a good place to look, we are finding kings and queens under every parking structure in the UK’ (p. 63). Another thing “Psychoarchaeology” tells us: “It’s certainly not possible to learn from them. All they mean to us is what we want them to mean. To claim we can learn from them … is in itself a projection” (p. 65). We recall the stream of objects in the opening story, how we noticed the book telling us to “sign in,” and realize we might be guests in the Hotel too. We look back in the text, trying to remember what else it said about guests. You Should Come With Me Now’s overarching motif of excavation crossfades into one of futile transportation—the “exporting [of] kitchens and dinner tables … into a field in the middle of nowhere” in “Jack of Mercy’s” apocalyptic conclusion; the moving of objects from one room to another in “Self-Storage”—and their accumulation. Many of these acts of piling, hoarding, and offloading happen in coded developing countries, a representation of capitalism’s hidden reality: “that our world is only under control because we ship our chaos and garbage elsewhere.” This generates unsettling echoes back to the train journey of “In Autotelia,” and the piling of coerced homeless people into the Astral Plane in “The Crisis,” which evokes a sense of human trafficking reinforced by images of washed-up, strewn-about body parts in some of the later stories. The logics and rationales that interconnect the collection range wildly and pile up like the objects in their characters’ rooms and storage units. There are literalistic links conducted by name (Autotelia), thematic links enacted by the repetition of words, images, acts, and spaces (e.g. “Dreamliner,” body parts, hospitals, and medical procedures), and recurring narrative devices like dreams and phone calls. Some of the time these undercut one another, even in the same story, as in “The Theory Cadre,” which mutates a character’s name across each of the numbered pieces that comprise it. Out of this immense, almost geological compacting of modes of reference emerges an exquisitely interpretable text. It is little wonder that one of the first (and best) pieces in the collection, “Yummie,” documents its protagonist’s experience with angioplasty, an operation of the heart. Hardly recognizable under the rubrics of popular fiction and traditional plot progression, the stories in You Should Come With Me Now proceed less narratively than emotionally, in a manner like someone scrambling during a divorce to divide assets, leave the shared living space, and attempt to construct a new life. The divorcée lurches forward into their condition not quite understanding—or believing—what has happened. So, too, do the characters here (to say nothing of the reader). Despite its frequent portrayals of alienation, exploitation, and melancholy, the collection seems to conclude on a note of hope: the failed, destructive relationship between Lizzie and Tim in “Cicisbeo,” which culminates in the collapse of their house; between the narrator and Myra in “Dog People”; between the reader and Balker in “The Crisis”; between the ghostly cottage couple in “Animals.” Each of these progress into the aloof but somehow functional relationship between Cave and Julia in the story of the same name. The relationship between Beatrice and Hampson in “Getting Out of There,” the penultimate story, ends on the other hand in as much of a positive configuration as a Harrison story ever has. Yet, this hope is merely tonal, like the final swirling reverberation left over at the end of a song, and only lasts insofar as the reader doesn’t ask any further questions (in a collection that has been engineered to invite questions). Beatrice and Hampson’s happy ending is immediately and subtly undercut when, in the final story, the lone narrator encounters a phenomenon eerily like Tim’s escape tunnel in “Cicisbeo” —and proceeds to cram all his stuff into it, after which point he “plan[s] to live on his wits, always moving east, pushing the furniture in front of [him]”; he lastly asks us not to inform those he is abandoning until he has gone (p. 257).